Cuor Di Bue – Tomato Town organically grows heirloom tomatoes in the greater Kansas City area as well as Johnson County, Leawood, Lenexa, Olathe, Shawnee, Merriam KS, Independence MO and Kansas City Missouri, KCMO. Varieties include: Cherokee Purple, Brandywine, Stupice, Carbon, Black Krim, Black Cherry, Yellow Pear, Absinthe and Aunt Ruby’s German Green. 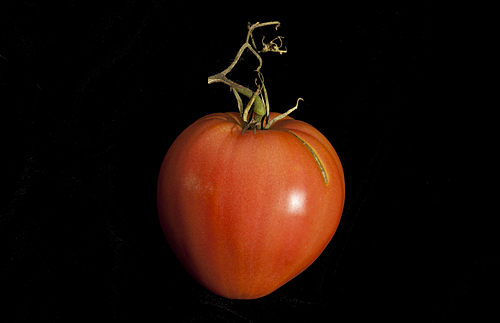 With a solid taste, this tomato has been a favorite on sandwiches and in salads, and Farmer J is looking forward to using this meaty fruit in her tomato sauces. This entry was posted on Wednesday, August 3rd, 2011 at 6:24 am. It is filed under TomatoTown Favorites, Varieties. You can follow any responses to this entry through the RSS 2.0 feed. i knew you guys would love this one! Do you have other hearts? I have Bull’s Heart, Reif Red Heart, Linnie’s Oxheart…all are stellar.